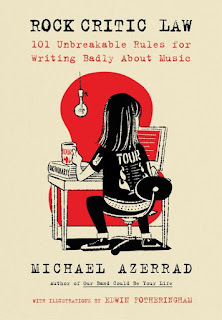 There are two new books that examine writers and their craft, both told through fun illustrations, A Sidecar Named Desire: Great Writers and the Booze that Stirred Them by Greg Clarke and Monte Beauchamp; and Rock Critic Law: 101 Unbreakable Rules for Writing Badly About Music by Michael Azerrad. The history of literature is filled with writers who were not shy about their love of alcohol. There arguably has been no greater catalyst for creativity among writers than a good, stiff drink. From Aristophanes' attraction to wine, to Dostoevsky's breakfast of grain vodka and brown bread, to Jane Austen's beer brewing, to Joan Didion's fondness for gin, there are plenty of stories of how gin inspired many literary icons. The new graphic volume A Sidecar Named Desire: Great Writers and the Booze that Stirred Them is an unforgettable literary bar crawl with Greg Clarke, an illustrator whose work has appeared in publications like The New Yorker and Rolling Stone, and Monte Beauchamp, an advertising art director and graphic designer who has received numerous awards and honors. A Sidecar Named Desire is filled with historical factoids, anecdotes, booze trivia, and fascinating detours into the lives of our most storied literary personalities, along with literary-themed cocktail recipes like Capote's Screwdriver, Jane Austen's Spruce Beer, and William Fauklner's Mint Julep. There is history on how writers included their favorite drinks into their works, such as this part on Charles Dickens titled "Victorian Era "Bottled Water." "The novels of Charles Dickens, the great social chronicler of his age, are suffused with beer, pub, and brewery references," Clarke and Beauchamp write. "Children in the nineteenth century, as reflected in Dickens's novels, drank 'small beer' or 'table beer,' as a less toxic alternative to the unsanitary water of the Thames. The butler in Dombey and Son (1848), when serving sickly Paul Dombey junior 'sometimes mingled porter with his table beer to make him strong.' In David Copperfield (1850) the boy hero and narrator speaks of 'going into the bar of a strange public-house for a glass of ale or porter.' In Great Expectations (1861) Miss Havisham has inherited her wealth from her father, who had owned and operated a brewery." 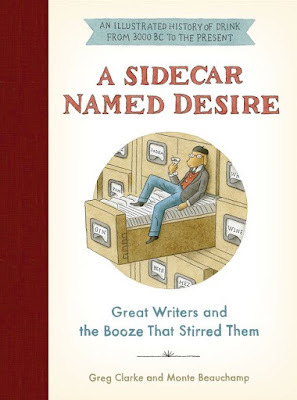 A Sidecar Named Desire is one of the most enjoyable books you will read, and be sure to sip on a cocktail while you read it. Michael Azerrad is one of the most well-regarded members of the music world, and is best known for his critically acclaimed music writing. In 2014, he could no longer ignore the shortcuts, lazy metaphors, and uninspired prose that music writers rely on to fill column inches, and he began his wickedly droll Twitter feed @RockCriticLaw to expose and poke a little fun at this word-salad. After a few years of doing this, he has consolidated all his "laws" into a witty, comprehensive, and fully illustrated book, Rock Critic Law: 101 Unbreakable Rules for Writing Badly About Music. While this book is entertaining as anything you will read on writing, is is a guide book for a new era in criticism, a reminder to rising writers to be bold and honest, and not just use the same tired cliches to fit into the critic's club. Azerrad writes, "Many Rock Critic Laws date back decades, having endured through metal, glam, prog, folk-rock, singer-songwriter music, new wave, alt-rock, Britpop, emo, neo-post-punk, and all the rest, and passed down through several generations of Rock Critics. From Paul Williams's, uh, seminal Crawdaddy! and on through publications such as NME, Melody Maker, Circus, Creem, Rolling Stone, the Village Voice, Musician, Spin, Blender, Mojo, Paster, and Pitchfork, a shorthand developed. Writers parroted a litany of rote phrases until it became a universally accepted lexicon, rarely remarked upon, much less censured. Until now. "A while back, I was reading some Rock Criticism and became peeved by a piece of boilerplate I'd seen countless times before, which can be summarized thusly: 'When musician A plays on musician B's album, and then musician B plays on musician A's album, musician B is 'returning the favor.'' Naturally, I had to share this devastating pearl of editorial insight with the world, in much the same way as you find something incredibly stinky and say to your friend, 'Hey, smell this!'" Be sure to say a band "tackles" a cover version of a song, as if it were a criminal who needs to be wrestled to the ground. When talking about violent rap lyrics you MUST cite Johnny Cash's "Folsom Prison Blues": "Shot a man in Reno just to watch him die." Or Bob Marley's "I Shot the Sheriff." When comparing two bands, you can never go wrong by making a Beatles/Stones analogy. Feel free to call something "an instant classic" even though, by definition, only time can tell if something is classic. You MUST use the word "rollicking" even though you would never say that word out loud. Please feel free to deny an artist's individuality and say they are "the new [x]." Why say someone "wrote" a song when you can say they "penned" it? When interviewing a woman in rock, you MUST ask her what it's like to be a woman in rock. All 101 Rock Critic Laws are accompanied by original illustrations from Edwin Fotheringham, the beloved original Seattle scenester who has become a highly regarded artist who has created album covers for groups like grunge band Mudhoney to iconic jazz label Verve Records. Rock Critic Law is a unique work because it is an inward look at music writing from one of the best to do it, and Azerrad teaches how to improve the craft through humor. Azerrad is also the the author of the critically acclaimed bestsellers Come as You Are: The Story of Nirvana and Our Band Could Be Your Life: Scenes from the American Indie Underground 1981-1991. This is an unprecedented article,Amazing insight you have on this. You can do something much better but i still say this perfect.Keep trying for the best.